Temple of the Dog's debut album was a masterpiece of rock. It was also the band's only album. Having no agenda beyond saying goodbye to a friend (Andrew Wood), six of the Seattle Scene's finest record an album over the course of two weeks at London Bridge Studios in Seattle. That album is pretty much perfect. Temple of the Dog: Seattle's super supergroup - aka - The best band that never was. I was young at the time, still reeling from the end of my favorite era of music (hair metal) when Temple of the Dog was foist upon me by Boston’s WAAF. My first thought, after wondering where Jani Lane, Joe Elliot, and Jon Bon Jovi went, was … whoa, this ain’t half bad! Temple of the Dog was the least supergroup supergroup ever created. If they formed today, then sure, you could accuse them of just being a bunch of all-stars getting together to make a buck. People would say that some of the guys from Pearl Jam and Soundgarden were just making the rounds, kicking tires, drumming up college funds for their kids. But they were actually almost a real band. Matt Cameron helped Stone, Jeff, and McCready launch Pearl Jam. Cornell was not only in Soundgarden with Cameron, but also friends with the other guys. There were in Cameron Crowe’s Singles together. Temple of the Dog was as real as it got. It wasn’t created produce hit singles or pad a record company’s coffers. Nor was it created to launch a band to superstardom or takeover MTV with music videos (though they did: Hunger Strike). Temple of the Dog was simply the result of a group of friends/bandmates/colleagues making music. How is that possible? Let’s see what Stone had to say. Other than a few shows, the band didn’t tour, didn’t do promos, and didn’t even really exist. At least not until 2016. 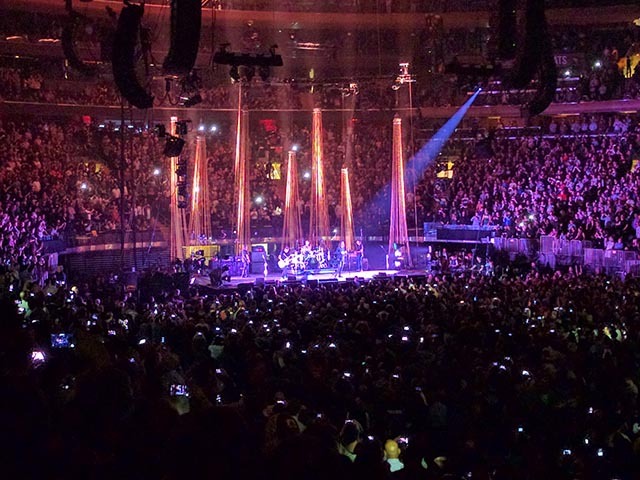 Discussing the album wouldn’t be complete without mentioning the time Pants and I went down to Madison Square Garden two years ago to see them. The Temple of the Dog MSG show was a long way timewise from their performance at the Off Ramp Cafe in Seattle’s Capitol Hill in 1990. A bit less hair, a bit more gray, … a little less Cornell vocal thunder. But all in all, just amazing. The funniest part about the Off Ramp Cafe is that it was a female-motorcyclist bar. Better yet, it was the club that Soundgarden appears in in Singles. One of the most complete songs I’ve ever heard. Growing up, I always preferred Hunger Strike. But as age and wisdom have taken over, I’ve come to realize just how incredible Say Hello 2 Heaven really is. It really is a perfect song. Starts with the solo arpeggiated guitar. Then the band kicks in with an entirely different riff. Then Cornell and crew arrive. The mounting amplification of Cornell’s overdriven vocals is a work of art. Their presence grows and evolves over the course of six minutes and twenty two seconds of song, such that by the time you hit chorus number three, you are feeling every emotion you’ve ever felt. As for the band, it’s the first time we hear the Mike McCready pickup switch mid-solo, something you hear later in Yellow Ledbetter. Invisible Matt Cameron does what he always does, hits every note with the exact amount of crash and drive. And, Gossard and Ament are flawless in their rhythmic execution. Exactly how do you describe one of the most powerful songs recorded and performed in the 90s? Stripped of its drums and bass, the alternate mix of Say Hello 2 Heaven really puts lead singer Chris Cornell on display. There is between your ears and Cornell’s raw vocal power. The longest track on the album by far. Reach Down is one of the songs directly written for Andy Wood. No one devolves into a 4-5 minute solo like Michael David McCready. The dude is straight up given to wail. I WANNNA REACH DOWWWWWWWNNNNNN … AND LIFT THE CROWD UP! The two biggest voices of grunge, alternative rock, and the 1990s, crush one of the most singable tunes of the decade. Cornell takes the highs, Vedder goes low. Before we judge too harshly, Hunger Strike was more than Dude-Bro rock, it had a very active message. It wasn’t pop fluff. Lyrically, it’s so much more than a radio hit. The riff to Pushin’ Forward Back is literally vintage Ament and Gossard. If they had kept this for their burgeoning project (Pearl Jam), I’m not sure it would have been as good. Vedder doesn’t do trepidation as well as Cornell. Look at all the hair! You’d think Temple of the Dog was a hair metal band. Mike McCready was once part of one with Shadow (I believe). Definitely a Cornell penned tune. You can hear it in the melody. Rick Parashar drops by for some piano work. Really completes the tonal foundation of Call Me a Dog. Harmonica! Gotta love Cornell on the harmonica. And, more Parashar piano. The piano really makes the self-titled album glow, giving it both mass and finesse. Times of Trouble would be repurposed into Footsteps, one part of the Momma-Son tape of Pearl Jam. I’m mildly shocked that Cornell wrote Wooden Jesus. Other than the repurposed Times of Trouble, it is the song that sounds the most like a Pearl Jam song. Cameron might be one of the more versatile drummers that I have ever heard. I’m not sure if he has a strength, but I detect no weakness. He hits all the notes, never seeming to overplay. Love the guitar work on Your Saviour. Signature Cornell vocal run on the “hey”. Awesome rhythmic interplay after the second “hey” part. Followed by McCready doing what he does best. The outro IS the sound of Seattle. That will always remain the exact sound I think of when I think of the Seattle Scene, and not Teen Spirit. Visceral lyrics, perhaps related to Badmotorfinger’s Rusty Cage? I’ve always appreciated songwriting that binds itself thematically to an artist’s other work. Cameron kicks All Night Thing off with a slow walk of a beat. Cornell and the organ come in right after. Perfect way to end Temple of the Dog’s self-titled album. The piano over the organ is tasteful, I dig it. Parashar, other than the memory of Andy Wood, might be the unsung hero of these songs. Astounding creative work, Rock & Roll at its best.